this will be the 98th all-time meeting between the two schools. Win or lose, Monday night’s Texas-Baylor game at the Erwin Center will say plenty about the current state of Longhorns basketball. While top-ranked Baylor continues to try to run the Big 12 table, Texas is not getting much respect in the national court of opinion. A home loss to West Virginia last week indicated this season’s team isn’t as feisty as Bevo in a makeshift Sugar Bowl stable. It would take a victory over Baylor — a team that has beaten them in 18 of their last 19 meetings — for the Longhorns to improve their national pulse. Although the Associated Press still has Texas ranked a respectable 12th in the country, the Horns’ chances of being highly touted in next month’s NCAA Tournament look iffy. Texas has played host to first- and second-round tournament games the past three years because the Longhorns were among the top four seeds in the bracket. According to ESPN’s weekly bracket projections, Texas would be a No. 7 seed if the tournament started today. The RPI that the NCAA selection committee uses while piecing together its March Madness bracket ranks Texas at No. 31 in the country. It doesn’t help that UT’s strength of schedule — normally a strong suit — is ranked 57th. By contrast, Iowa State — a team Texas beat last month in Ames — is No. 2 in the nation in strength of schedule. Baylor is ninth. The NCAA will have its first “reveal” of the top 16 teams in the NCAA Tournament bracket on Feb. 11. Coach Karen Aston has a time-honored solution to the team’s dilemma. “Just win,” she said. The Longhorns have eight regular-season games, plus the Big 12 tournament in Oklahoma City, to prove they are worthy of hosting NCAA Tournament games for the fourth straight year. When Texas has played host the past three years, the Horns has won first-round games by an average score of 82-49 and second-round games by an average of 81-67. Being in friendly territory doesn’t guarantee a victory. In 2015 Texas was shipped to Cal. 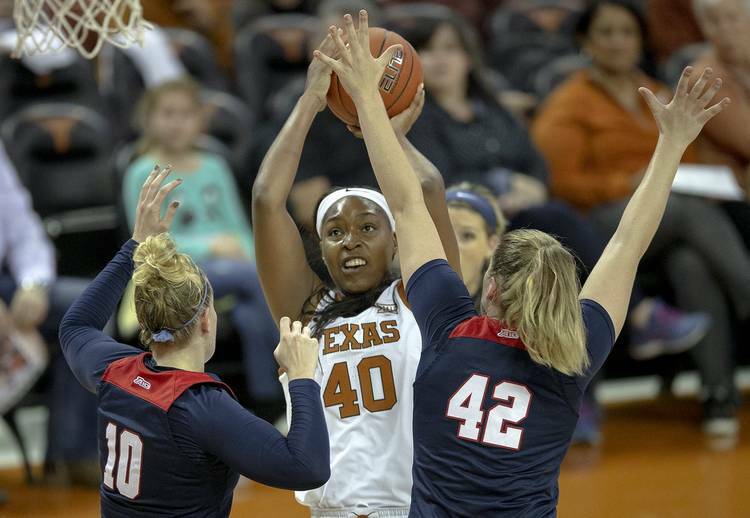 The Longhorns prevailed in a pair of tight games — 66-64 over Western Kentucky and 73-70 over Cal. As for UT’s strength of schedule, the Longhorns are not entirely to blame. Perennial playoff contender Tennessee (14-7) recently nose-dived with a six-game losing streak. A victory over Michigan (12-9, 3-6 Big Ten) looked good in November. So did a victory over Duquesne (11-9, 5-2 in the Atlantic 10). In recent weeks Texas has been victimized by poor starts and turnovers. Aston consistently switches her starting lineup, looking for a group that clicks together. Texas ranks eighth in the Big 12 with 17 turnovers per game. Baylor, by contrast, ranks first with 11.9 per game. For Baylor and Texas, who will be playing each other for the 98th time, winning in March will always be more important than winning in February. Texas associate head coach Jamie Carey, who played on the 2003 Longhorns team that reached the Final Four, said there is still time to make this a season to remember.